Grapevine City Hall is located at 200 South Main Street, Grapevine, TX 76051; phone: 817-410-3000. Photo: Torian Log Cabin, ca. 1845, Main Street, Grapevine, TX. The Historic District was listed on the National Register of Historic Places in 1986. Photographed by User:Wildstoo (own work), 2012, [cc-by-3.0 (creativecommons.org/licenses/by/3.0)], via Wikimedia Commons, accessed August, 2014. 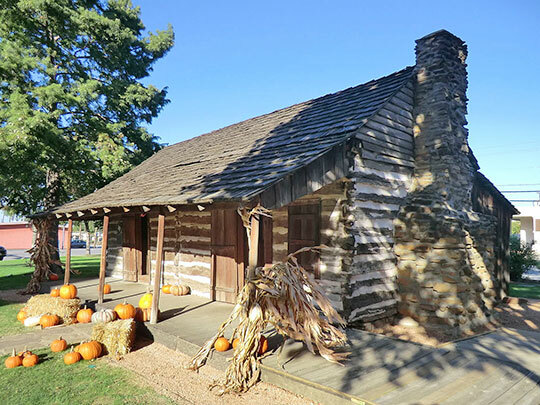 Archibald Leonard came to the area in 1845 and settled with the "Missouri Colony," from Platte County, Missouri. He was proprietor of a store on his land by 1849. About 1854 James Tracy Morehead, A. F. Leonard, and Henry Suggs platted a town and arranged to have a post office located here. The town was named for nearby Grape Vine Springs, and the numerous grapes which were grown in the area. The Grape Vine Sun began publishing in the 1890s. About the turn of the century the St. Louis Southwestern Railway ran through the town. In 1814 the post office changed the spelling of Grape Vine to the singular word, Grapevine. The town incorporated in 1936. Texas State Historical Association, Grapevine, TX, www.tshaonline.org, accessed August, 2014.